MF Doom is on the verge of taking over the world. 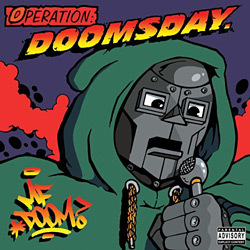 Code name: Operation Doomsday, the year: 2001. Almost 10 years after MF amazed the world as Zev Love X, partner of DJ Subroc in the brilliant hip-hop formation KMD. In the meanwhile 'twin brother' DJ Subroc has passed away, but is not forgotten: 'The illest, dynamic duo on the whole block, everything's goin according to plan' Doom warns. This comeback is a blessing for hip-hop purists: while listening to the LP you enter an imaginary world thru old SF-movie skits, comic book references, 80s soul, jazz standards and fairytale-like beats. Lyrically, this album is truly a blessing. Expect no hooks or even choruses but straight-on flowin, mad lyrical styles and crazy imagery. Doomâ€™s without a doubt one of the best lyricists of the moment: 'me and this mic is like ying and yang' . In 'The Mic' Doom expresses his love for the instrument. The albumâ€™s an ode to the old-school, not only lyrically: plenty of skits have sequences from the hip-hop classic 'Wildstyle' and most of the beats have an old school patterns, like 'Doomsday' with the drums of BDPâ€™s 'Poetry'. Fellow Monsta Island Czars join Doom on 'The Finest', on the rugged, up-tempo and apocalyptic 'Who you think I am?' and 'Operation Greenbacks', an on- and off tempo beat with a soulful touch. Bobbito aka Cucumber Slice shouts for mash potatoes, apple sauce and buttery biscuits on 'Rhymes like Dimes'. This track also appeared on the 'Greedy Fingers'- (Grazz and Tony Vegas) album in a darker version and with a slower beat. Here, MF laces a fast, mellow beat with a magnificent, hypnotic sample from James Inghramâ€™s 'One Hundred Ways'. 'Gas Drawls" is a jazzy beat with relaxed, bugged-out rhymes 'the supervillain, cooler than a million, i be chillin', just as the next track '?' with another movie reference: 'anyday I feel like it's an off-day like Ferris Bueller' and featuring the highly anticipated comeback of Kurious Jorge. The album closes with 'I Hear Voices' (if you copped the CD you'll have the video clip as bonus feature), the beat is mad crazy, like a race scene in a 70s motion picture, the flow is fast as hell. It's the apotheosis of a marvellous album which announces the beginning of Doom's reign over planet Earth. MF Doom: the world is yours!